Ah, conferences… I love them! That is, I love attending them, listening in awe whilst lurking silently in the back row. Not so this time! Having had my arm kindly but firmly twisted to take the plunge and present, I gulped hard when I discovered that I was due to kick off proceedings as the first speaker at the Language Studies PhD conference 2015 at the University of Reading. No pressure then! Well, I survived and am here to tell the tale, and to my surprise I thoroughly enjoyed the experience, even plucking up the courage to ask the odd question or two. Who’d have thought! Altogether 22 PhD researchers from English Language & Applied Linguistics, the Institute of Education, Psychology & Clinical Language Sciences, and Modern Languages & European Studies talked about their research in front of an audience of fellow-students and lecturers. In a day that lasted from 9am to 6pm, time flew by as we heard about topics as varied as language policy in Namibia, female twitter users in Saudi Arabia, Greek EFL writing, and aspect binding in Mandarin Chinese, to name but a few. Luckily the audience wasn’t the heckling kind; on the contrary, comments and questions were supportive and helpful. As well as a round of applause, each speaker also received constructive written feedback on their presentation skills. The conference concluded with a panel session on the Language Studies Working Papers – an annual peer-reviewed digital journal with contributions from staff and PhD-researchers at the University of Reading. Some of last year’s student-contributors spoke persuasively about the benefits of submitting a paper, such as article-writing practice, attention to detail and development of reviewing skills. And the best thing: you can develop your text for inclusion in your thesis! Sounds like a win-win to me. Find all necessary information, including format templates and past issues, by clicking here. But hurry! This year’s deadline is 30 April 2015. Many thanks go to Dr. Jackie Laws for organising this enjoyable, instructive and multi-disciplinary day. It certainly changed not just my view of conferences for the better, but also my view of myself. If you’re in two minds whether to give presenting a go, here’s my advice: just do it! 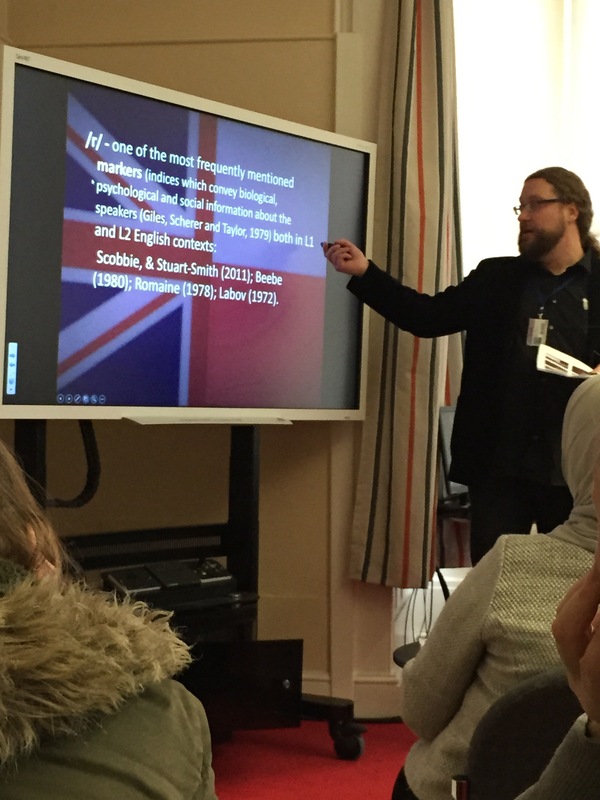 Click here to watch a 10 minute video of my presentation: German as a school subject in the UK: discursive representation, motivation and uptake. How you roll your /r/’s says a lot about you!